Requiring no ductwork, baseboard heating can be an easy-to-install and affordable solution for many homeowners. Is it right for you? Find out more here. Baseboard heating can be an effective and affordable solution, either for the whole house or as a supplement in rooms underserved by the main heating system. Baseboard heating offers several advantages over the average forced-air system. For one thing, baseboards operate almost silently, in contrast to the noisy blowers of forced-air heating. Another advantage of baseboard heating is that it requires no ductwork. That means two things: One, it’s relatively easy to install, particularly in older homes, where adding ducts can be so problematic. Two, whereas forced-air heating ducts should be serviced regularly, there’s little ongoing maintenance to do with baseboard heating. Last but not least is a matter of preference: Many homeowners like how baseboard heat comes out evenly, not in intermittent blasts. Technically speaking, electricity plays a role in all baseboard heating systems, but there are some that run exclusively on electricity. 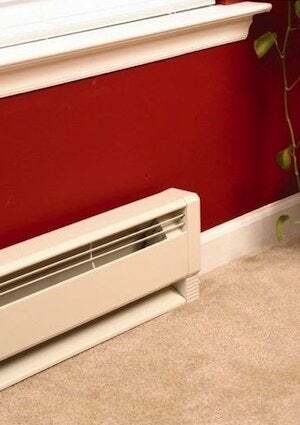 You can put these in every room of the house if you want, but it’s far more customary for an electric baseboard to provide supplemental heat for individual rooms on an as-needed basis. One common usage is for baseboard heat to run in a bedroom overnight, while the whole-house heating system can be put on a budget-friendly low setting. Did you ever wonder why baseboard units typically appear beneath windows? In a word, the answer is: science. Baseboard heating works through convection. As cold air falls from the window, it enters the baseboard unit through a vent. Within the baseboard, the air is warmed by a series of metal fins that have been heated through electricity. The warm air then rises from the baseboard, and the pattern repeats itself, creating a circular flow known as a convection current. 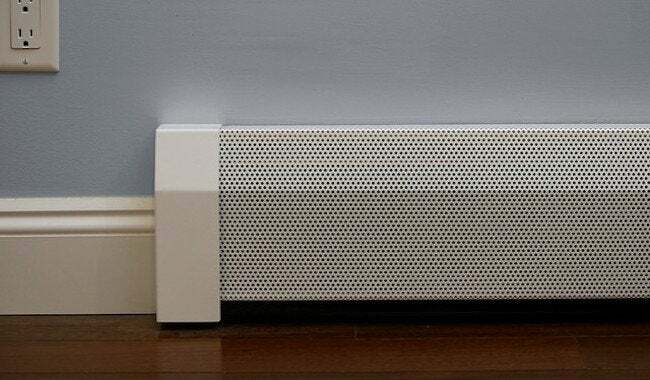 Plug-in portable baseboard heaters exist, but the best baseboards are hardwired into the circuity of a home (with 120-volt or 240-volt supplies, either of which calls for the installation services of an electrician). Some electric baseboard heating units feature an integrated thermostat; others are set by an in-wall controller. Though inexpensive to purchase, electric baseboards are somewhat infamously inefficient, meaning they can be costly to run for any prolonged period of time. It’s for this reason more than any other that homeowners typically choose not to rely on electric baseboard heating units as full-time solutions for the whole house. In a hydronic baseboard unit, the mechanics are similar but slightly different. Electricity still generates the system’s heat, but it does so indirectly. First, the electrical current warms up an enclosed fluid, either oil or water, and then that fluid radiates heat into the room where the unit has been installed. Hydronic baseboard heating systems operate more efficiently than do electric units, because once the fluid has been warmed, it takes longer to cool down (the metal fins in an electrical baseboard, by comparison, cool down very quickly). That’s why if you come across a home in which baseboard heating is the one and only system of delivering heat, chances are high that it’s a cheaper-to-run hydronic system. What are the cons? In a whole-house hydronic system reliant on water circulated from the water heater, the lines can be disturbed by an intrusion of air. Fortunately, there’s an easy fix: bleeding the pipes. Another drawback is that compared with electric baseboards, hydronic units take longer to heat up. For many homeowners, however, the efficiency of hydronic baseboards amply makes up for their slow start. The bottom line is if you only need to heat your house for a fraction of the calendar year, or if on occasion you want to make one or two rooms more comfortable, electric or hydronic baseboard heat may be the solution you’ve been seeking. When's the Right Time to Install Radiant Heating?